Sizing John, ridden by Robbie Power and trained by Jessica Harrington, powered home to win the Cheltenham Gold Cup. Victory completed a big-race double for the 7-1 chance, who won the Irish Gold Cup at Leopardstown in February. He finished two and three quarter lengths ahead of Minella Rocco (18-1) in the Cheltenham showpiece, with Native River (7-2) in third. Lizzie Kelly, the first woman for 33 years to ride in the race, was unseated from Tea for Two at the second fence. The 3-1 favourite Djakadam hit the second-last fence when leading and ended up finishing fourth, while the much-loved Cue Card again fell three fences from home. Harrington and Power finished the Festival in style by winning the last race, the Johnny Henderson Grand Annual Challenge Cup Handicap Chase, with Rock the World (10-1). The seven-year-old winner was a first Cheltenham Gold Cup entry for Harrington after moving to her yard from Henry de Bromhead's earlier in the season. Harrington, the most successful female trainer ever at the Festival, had previously enjoyed big-race success with Moscow Flyer in the 2003 and 2005 Queen Mother Champion Chases, and with 2014 Champion Hurdle winner Jezki. "It's amazing - he has gone from running two miles at Christmas to three miles here," she told BBC Radio 5 live. "He jumped like a buck and it was his jumping that got him there. "I never seemed to have any stayers before for this race - I can't believe it." Harrington is the third woman to train a Gold Cup winner, following Jenny Pitman, who guided Burrough Hill Lad (1984) and Garrison Savannah (1991), and Henrietta Knight with Best Mate (2002-2004). Power, who won the Grand National on Silver Birch in 2007, said: "It's unbelievable. Jessica Harrington is a genius. "I was only 25 when I won the National and I'm 35 now. When you're 25 you think you can win everything, so this is very special. "Down to the last he absolutely pinged it and then it was just a case of seeing it out. It's what every jockey dreams of and I never thought I would until we got this lad. "I had a bad injury before Christmas and I rushed back to ride him in the Irish Gold Cup"
Minella Rocco trainer Jonjo O'Neill: "It was his first run proper of the season. He has no miles on the clock and he'll improve a ton on that. I'm thrilled, he had a great spin round and finished as strongly as anything." Native River owner Garth Broom: "I felt we were slightly robbed of second right on the line, but finishing third in a Gold Cup with a seven-year-old is something you can't complain about. "He wears his heart on his sleeve and we are so proud of him. We had two dreams - to have a runner in the Gold Cup and to win one, and we've achieved the first. Djakadam jockey Ruby Walsh: "The mistake at the second-last cost me second place but I don't believe I would have done better than that." Cue Card assistant trainer Joe Tizzard: "He has come back safe and that is the main thing we were concerned about." The 2017 Gold Cup was billed as competitive, but not necessarily the greatest staging in the race's 90-plus-year history. 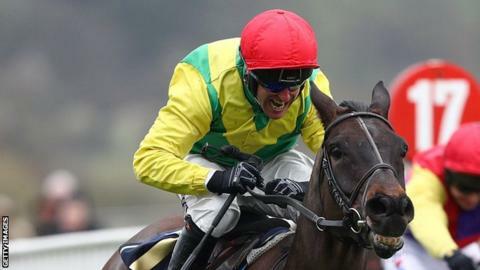 You probably can't say at this stage that Sizing John is all set to be a great champion, but given time, who knows? He's got that certain something about him - racing purists would say 'class' - he's only seven years old, technically some way short of his prime, and the time of the race was decent. There had been doubts about the horse's stamina lasting out the demanding three and a quarter miles, but he had plenty of reserves to positively bound up the final hill. Paul Townend rode a 356-1 double for Willie Mullins after top weight Arctic Fire (20-1) took the County Hurdle after being off the track for 13 months, while Penhill then triumphed in the Albert Bartlett Novices' Hurdle. Penhill's win was Mullins' first in the race and gave him a sixth win of the meeting. Gordon Elliott matched him with his sixth win when Champagne Classic (12-1) took the Martin Pipe Conditional Jockeys' Handicap Hurdle for JJ Slevin. However, Elliott clinched the leading trainer award thanks to his three second places compared to two from Mullins. A delighted Elliott said: "To win the trainer award is something special. Willie is an amazing man and a gentleman. We are absolutely thrilled. "When we get home now, we will have a party with all the staff." Champagne Classic's owner, airline boss Michael O'Leary, was somewhat surprised by the horse's achievement. "We buy them in numbers and you get a few duds - he is one of the duds!" Frost's win meant that for the first time all three races for amateur riders at the Festival were won by female jockeys. She was also following in a family tradition - her father Jimmy rode Morley Street to victory in the 1991 Champion Hurdle, while brother Hadden won at the 2010 Festival. The day's other race, the Triumph Hurdle, was won by the 5-2 favourite Defi Du Seuil, ridden by champion jockey Richard Johnson and trained by Philip Hobbs.